Honolulu, HI–A SPECIAL Internet broadcast featuring Dr. Leonard Horowitz and Sherri Kane interviewing honored guest Mike Anderson about a cancer patient who sought and found help with OxySilver will air tonight, 9PM Pacific Time on BBSRadio.com. OxySilver is the world’s most advanced silver hydrosol that triggers miraculous healings the same way the “Holy Spirit” naturally does to restore, sustain, and extend your life. OxySilver operates bio-electrically to provide vaccine free natural nutritional immunity and freedom from immunization toxicity. OxySilver makes deadly antibiotics and risky vaccinations obsolete, extending the potential to live disease free globally. OxySilver is the world’s first mineral water that is recommended for augmenting the power of prayer. Dr. Horowitz celebrates this prescription based on LOVE–the “Universal Healer”–vibrating Water–the “Universal Solvent” with the resonance of chlorophyll–528Hz/528nm. Prayer works best with LOVE528. It brings about healing optimized by atonement (a-tone-meant; at-one-meant). There is spiritual unity and Divine harmony in devout prayer; and in the musical mathematical matrix of creation that the religious world calls the “Kingdom of Heaven.” OxySilver vibrates in sync with nature, the Creator, and LOVE528. The sun, made entirely of hydrogen, emits light (photons) and sound (phonons) via electrons that resonate fundamentally 528Hz frequency according to NASA recordings. Compare the sound of the sun with the pure tone of 528Hz produced by 528 tuning forks. They are very much alike, with 528Hz at the heart of the sun’s sound. Chlorophyll also broadcasts structurally and energetically mostly 528Hz frequency of sound and 528nm of light. This is all synchronized with the sun’s frequency of electron energy. This is how and why chlorophyll produces oxygen from carbon dioxide resonating in 528. You breath O2 resonating, and phase-locking, you to the Source of LOVE528 from the “Father” and the sun. The Creator sang, “Let there be light,” to create the sun and universe. This revelation is best summarized by the word ALOHA. The “A” and the “O” represents the alpha and omega, the beginning and ending of the Greek alphabet and eternity. The “L” represents LOVE in the Gematria. It is located at the heart of the Hebrew alphabet. Of course the “HA” represents the “breath of life,” or the “prana” that carries life sustaining spiritual energy. These are just a few revelations from The Book of 528: Prosperity Key of LOVE, why the botanical world celebrates greenish-yellow chlorophyll, and why you need to sing, pray, and heal in 528. Grass’s pigment is primarily vibrating at 528–the color of the “heart chakra”–and heart of the rainbow, reflecting electrons of light through the crystal prism of Heaven’s Water that you experience as rain. Dr. Horowitz’s earliest successes in this field occurred with the development of 528-resonating OxySilver. In 2009, this healthguard became a top-selling silver hydrosol. It demonstrates its power to “green medicine,” and has been gaining praise by providing a new, powerful, and far-safer way of terminating infectious diseases. OxySilver is not a drug (no matter what the FDA decrees). It is actually a new type of mineral water in which the only mineral, silver, is a super-conductor of electrons. This mono-atomic silver is bonded to the oxygen in pure water during the high-tech manufacturing process. Water is a second superconductor of electron energy in OxySilver. This is why Dr. Horowitz recommends taking OxySilver with prayer. They complement each other to synchronize, or “phase-lock,” the miraculous healing power of LOVE and prayer from your heart, and the good vibrations and positive intentions and attitudes prompting healing. What else should a Holy Water do? Pure tone 528Hz sound, and 528nm of greenish-yellow light, resonate powerfully in OxySilver due to the unprecedented manufacturing process using technology developed by NASA for keeping astronauts healthy in space. The combination of 528 sound, light, and double-super-conductive-water, super-conducts the power of LOVE–the “Universal Healer”–to every cell in your body, instantly. OxySilver acts like a “Holy Water” for the above reasons. It offers faithful and intelligent people fleeing from medical mischief the greatest protection since manna. Thousands of doctors are now using OxySilver most successfully. 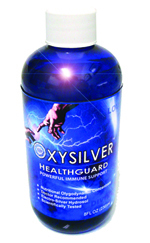 Besides OxySilver Healthguard, sold for only $49.40 per 8 ounce bottle, with 40% off a case of 18, for only $533.52. Our “OxySilver Professional” brand is used in hospitals to bring patients back from the brink of death. If you have not read a related article on Billboard Magazine’s coverage of recording artist Ameriie’s new album, Cymatica, Vol. 1, exclusively produced in 528Hz to help with genetic restructuring, read . . . .
Amerlie Tells Producers to Tune to 528. . . . CLICK HERE. And don’t forget to join Dr. Leonard Horowitz and Sherri Kane interviewing Mike Anderson about his friend with cancer who was help with OxySilver. CLICK HERE to enjoy the program at 9PM, Pacific Time TONIGHT, July 19, 2011. AND ORDER YOUR 528 TUNING FORKS HERE. If you have not already signed up for free to partner with Dr. Horowitz and Sherri Kane, click the Healthy World Affiliates banner here. It offers you free membership in Healthy World Organization–advancing to replace the corrupt World Health Organization. You get a valuable website to start your own business immediately. Be a part of the shift in energy, integrity, and sustainable prosperity.